Baby Things I Want: Introducing...Hatchalah-Kalah.com! My name is Melissa Ser, and I'm a mom to two lovely boys who are about to turn 4 and 1. Since I work full time, I try to make every minute with my boys count! I breastfeed, co-sleep, and babywear. I've just begun a side business, hatchalah-kalah.com, selling baby carriers that are both comfortable and fashionable, and offering consultations. When my first son was born, I received a BabyBjorn as a gift. It was great, at least until A. weighed more than 5 kg. It cut into my shoulders, and I just couldn't ever get it adjusted properly. In short, I hated it (apologies to the BabyBjorn fans out there). But so began my adventures in babywearing. A few months later, when A. was closer to 8 kg and I couldn't take it anymore, I bought a stretchy wrap at Shilav. It was cheap and comfy (good) but it sagged, it was hot, and I couldn't ever get it tied securely for more than a half hour (bad). Little did I know then that stretchy wraps are only good to 9 kg.... And forget about back carries -- not safe at all in a wrap that sags. When Y. came along, I searched and searched for the best wrap on the market. Something that would be secure, comfortable, lightweight, and beautiful. 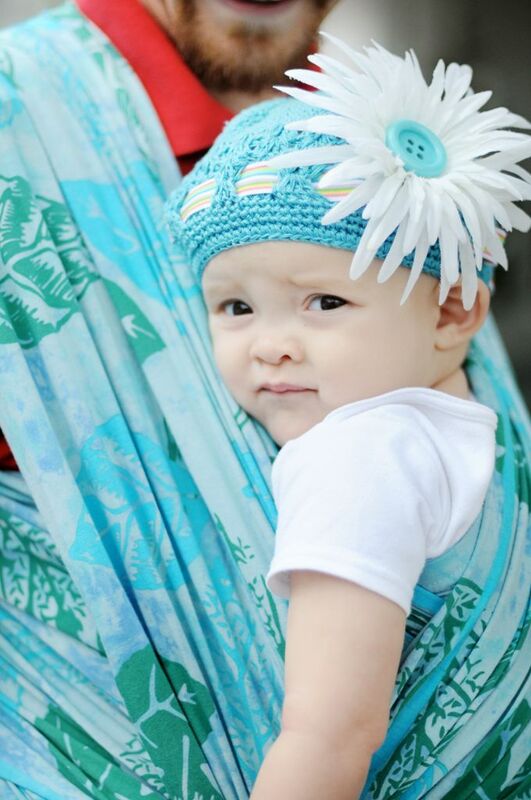 I found this wrap -- Wrapsody Baby Bali Breeze -- mentioned on every single babywearing forum I went to. Cool, gorgeous, sturdy, and able to carry up to 16kg comfortably. I had to have one. I ordered one in blue and gray Whitman (see right). A few months later, when I'd gotten bored of having just one wrap, I ordered a second one in a rainbow pattern, Iris. Whitman's blue and gray got the attention of my husband, a Dallas Cowboys fan. But Iris is just gorgeous. Y. gets all excited when I pick it up. And there are more patterns, all hand-dyed and hand-batiked under Fair Trade conditions in Bali. I love the softness of a stretch wrap too, and the Bali Stretch Wrap (same Fair Trade conditions), which I also stock, is a hybrid wrap. It's jersey cotton (100%), but since it only stretches width-wise, not length-wise, you can be sure that your carry is secure, even on your back, and even with children up to 16kg (or more). This is the wrap of choice for tandem carrying twins or an older child and newborn. It's not too hot either, since there is no lycra in it. The hardest part is deciding which pattern to order. I love Arie (see left), because its blues and greens remind me of spring. What's your favorite? that she'd ordered from the US-- and I just knew I had to have one of those too (and that I had to stock them). First, you can carry up to 18kg comfortably, and secondly, they are just beautiful (see right). It's based on a a traditional Asian carrier design, but has the addition of triple padded straps, customizable designs, a nice strong headrest, and a toy ring -- essential when baby is on your back. The Mei Tais are also pretty easy to get the hang of -- and yes, just like in a wrap, you can discreetly nurse in them. I carry Y. (around 11 kg now) pretty much everywhere (and have even managed to carry A. once or twice -- he's 17.5 kg.). Y. even comes to work with me sometimes (see left), where he takes a nice nap in Iris while I get my other job done. People have actually been surprised when they've seen me with my stroller (it leaves the house about once a fortnight). It's a beautiful turquoise Peg Perego Pliko P3 -- but it doesn't fold up into a small pouch and tuck into my diaper bag. I am the sole distributor in Israel of Wrapsody Baby wraps and BabyHawk Mei Tais. You can check out my site,hatchalah-kalah.com, and you'll occasionally find me at street fairs and malls. I'm also available for a consultation by appointment. I'll be at Kenyon Hadar this Friday, August 6th. Come say hi. Mention that you read about me onbabythingsiwant.com and save 15 NIS on a purchase. It's your beginning. Make it fashionable. Make it comfortable. Make it yours. Thanks to everyone who stopped by to see us today!